Andy Hei Ltd. was founded in 1999 on Hollywood Road, in Hong Kong’s traditional antiques quarter. It has since become one of the most renowned galleries for fine Chinese antique furniture and works of art. Andy Hei has more than 30 years’ experience in the appraisal and conservation of classical Chinese furniture. He is the second generation of the prominent H.L. 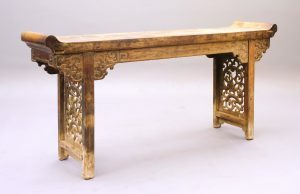 Hei family, which has been dealing in huanghuali and zitan furniture from the Ming and Qing dynasties for over half a century.